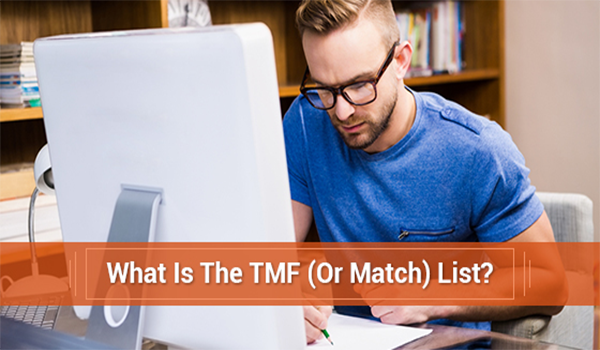 What Is The TMF (Or Match) List? The TMF list is compiled and organized by MasterCard and basically lists those businesses whose merchant accounts have been terminated over the course of the last five years for one reason or another. As useful as this list is for banks looking to mitigate their exposure to risk and risky clients, it can make doing business quite difficult for merchants who unfortunately find themselves on the list. The list is made all the more difficult by the fact that many merchants are completely unaware that they were ever even on the list until they go to apply for a new merchant account and are subsequently turned down. Inclusion on this list can even end up following merchants on to new business ventures and make obtaining credit quite difficult. Most, if not all financial institutions, put a considerable amount of trust in MasterCard’s list, which means that any time you take your business to a new bank or merchant services provider, they will assess their willingness to do business with you and which terms to offer you based on this list, which the majority of the financial world has access to. The only recourse that merchants have once they have been listed on the TMF is to contact the financial institution which listed them and attempt to resolve the dispute. Only the processing bank that originally placed a merchant account on the list has the power to remove a name once it is there. If a merchant feels, however, that their name is unfairly on the list or that a financial institution is being unreasonable, there are lawyers who specialize in this area. The bottom line is, the TMF is not a list that you want to be on as a merchant. It is permanent and taken very seriously by financial institutions and merchant services providers. The best way to avoid ending up on the list is to ensure that you are always making a strong effort to conduct responsible, ethically sound business, but, as with most things in life, the unforeseeable happens, even when you are taking measures to protect yourself.